Swift Ultraviolet/Optical Telescope image of Supernova 2006jc in the galaxy UGC 4904. Credit: NASA/Swift/S. Immler. As the name suggests a 'supernova imposter event' is a stellar phenomenon that outwardly resembles a (very faint) supernova – the explosion and almost complete destruction of a star – but that in fact leaves the star intact. The hallmarks of a supernova imposter event are a spectrum characteristic of hydrogen and having spectral lines that indicate relatively low gas speeds. Imposters outshine their pre-outburst states by several magnitudes, and reach roughly the brightness of the the most luminous stars (but well below that of true supernovae). What causes an imposter event is unclear but is thought to involve the star exceeding its Eddington limit, which brings about a major mass loss. Only a few stars are known that have exhibited this phenomenon. They include Eta Carinae (in 1843), P Cygni (see P Cygni profile), and several objects labeled as supernovae – SN 1961V, SN 1954J, SN 1997bs, SN 2008S in NGC 6946, and SN 2010dn – but for which detections of surviving progenitors have been claimed. In a couple of cases, imposter events have been observed shortly before the star actually did blown up as a supernova. The first was a star, located in the galaxy UGC 4904, 77 million light-years away, which had been identified in 2004 an imposter and then exploded for real two years as the supernova called SN 2006jc. The second was spotted in the galaxy NGC 7259, about 66 million light-years away. 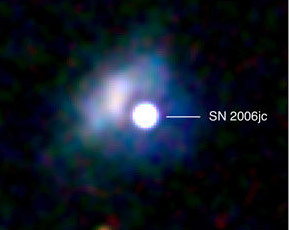 In 2009, this star was seen to brighten so rapidly that astronomers were misled into naming it a supernova, SN 2009ip. But it dimmed too quickly, exposing it as a fraud. Twice more it flared up, without self-destructing. But then on September 26, 2012, it brightened more than before and revealed, through the spectrum of its light, that it had shot out material at 13,000 kilometers per second – a clear sign that it had finally blown itself to bits.